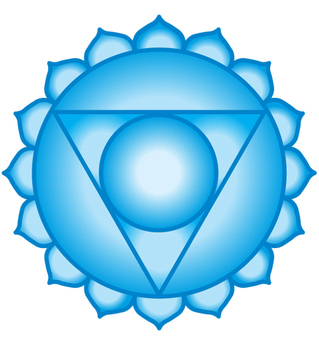 The throat chakra is located around the throat / neck region. The color associated with this chakra is sky blue, and it reflects our ability to communicate honestly. Voice is vibration, and this energy center influences the vibrations that come out of our mouth. Did you ever criticize a person, and did not realize how such words came out of your mouth? Did you ever lie, and couldn't explain why? Do you always suffer from a sore throat? Well, those are common sign for an unbalanced throat chakra. When the throat chakra is balanced, we only speak the truth at all times, our ability to communicate enhances, and the words that come out of our mouths are well controlled. With a healthy throat chakra, we have the ability to control when to speak, and this is a very important factor when it comes to spiritual development because speaking when it is not necessary is just a big waste of energy. When the throat chakra is over active, we tend to speak A LOT, and in return we never listen. To listen, one should have a calm pure mind, and when the throat chakra is balanced, the right words will flow out of no where; So, it is very wise to balance your throat chakra to enhance your ability to listen to others, and to speak the right words. Now that you are relaxed, imagine, and feel a sky blue energy ball spinning in your throat area, feel it moving back and forth, left and right, up and down, completely purifying your neck region. As you feel the vibrations rising in the throat area, say and feel the following affirmations "I communicate perfectly with myself, and others. I speak only when i need to. I can listen to others with a pure mind trusting that whatever words will come out of my mouth are going to be perfect. I speak honesty. I speak love." Continue to say those affirmations until you completely feel them, and believe them. When done, thank the sky blue energy for healing your throat chakra, and end your meditation. Listen to the guided meditation below if it is not easy for you to meditate on your own. To practice wise speaking we should first understand how to listen. Many of us fall in the mistake of trying to prepare an answer when someone speaks to us, and instead of listening carefully, we keep our mind busy analysing what we hear to form a correct answer. To listen means to clear your mind from any thoughts as you hear the words, and deep inside you, be sure that when it is your turn to speak, the right words will just flow out of your mouth. This is the key to wise speaking, because if you can't listen, your words are not going to be of any value. Also practice expressing yourself without fear. When you fear expressing yourself because you are not sure how people will judge your words, you turn yourself into an approval seeker. It does not matter what people think, express yourself to feel the JOY of being able to express yourself. Practice speaking only positive words, think thousands of times before you criticize someone. To speak wisely, speak positively or simply zip your mouth, and smile. Essential oils like eucalyptus, tea tree, sandalwood, cajuput, frankincense, lavender, and clary sage are great tools to help balance, and purify the throat chakra, you can use them during meditation or just in the room where you are present. For more information on how to use essential oils please check how to use essential oils effectively. Soups, hot drinks, juices, hot water, and fruits can all help balance the throat chakra. Make sure to drink enough water on daily basis; this will not only help your throat chakra, but will also help your whole body to detox. It is important to highlight that when i say drink enough water, i mean enough water supply from juices, soups, and of course pure water. When the throat chakra awakens, you may get a sore throat as a sign of detox, but this disapears after a while, and never comes back. Many also report a buzzing energetic sensation in the throat region, and sometimes it feels like an air ball moving up and down the throat.